This object is on display in the Space Science exhibition at the Steven F. Udvar-Hazy Center in Chantilly, VA. 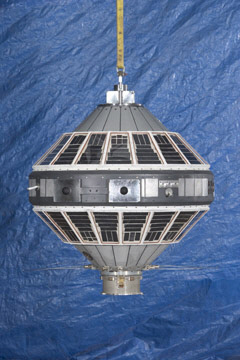 Full-scale replica of the Explorer VII spacecraft. The satellite was launched on October 13, 1959 atop a Juno II vehicle and successfully went into orbit. The spacecraft carried an array of instruments designed to study a broad range of radiation from the sun including X-rays, the intensity of cosmic rays and the field of charged particles in the ionosphere as well as micrometeorite impacts. It provided data from its instruments for 13 months, during the course of which it sent back readings acquired during a major solar flare. The object was transferred to the Smithsonian Institution by NASA's Marshall Space Flight Center in August 1972 and was restored in 2005.